This month’s Advanced Pole Fishing is packed with top tips, tackle and tons of ideas for your next pole fishing expedition. 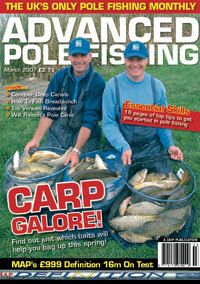 Whether you fish matches or just pole fish for pleasure there’s something in this issue to suit you. As usual, England international Will Raison has all the answers to your questions. This month he covers the effects of wind on commercials, double leam… and pigeon droppings! In February, editor Pat MacInnes gave the Shimano Force Master XT1600 an 85 per cent overall rating and praised its brute strength. This month four lucky winners can each walk away with a Force Master pole, just for completing a wordsearch. Do you have problems locating fish in deep water? Are you unsure which rigs will get you more bites? Or how to feed for certain species? Stainforth Angling Centre boss Mark Price has all the answers in his in-depth guide to deep-water fishing. This easy-to-read section is full of tips and advice for every level of pole angler, from the beginner to the more experienced. Kent-based Derek Gladwin is challenged to a match on a venue he has had lots of success on over the last few years. His travelling partner Sean Clifford is the challenger, and he’s in no mood to roll over and let Derek win as APF’s cameras venture south for an explosive encounter. Clint Elliott. This month the White Acres fishery manager is under pressure to perform on the final day of the White Acres Silver Fish Festival. As we follow his every move does he succeed… or does he fail? Sean Ashby has had a meteoric rise from Derby junior to an England cap and bronze medal in the World Championship. While fishing at Barston Lakes he tells how he got to the top and what it takes to win. The white stuff can be deadly in the winter if you know how to fish it. Sensas North West star Lewis Breeze certainly does, and he demonstrates his tactics for a successful bread session. The Oaks Fishery, near Thirsk, is a very popular venue with match and pleasure anglers alike. It certainly responds to a pole approach, as venue regular Darrell Taylor explains.